A Naked Neck rooster, with domestic turkeys in the background. The Naked Neck is a breed of chicken that is naturally devoid of feathers on its neck and vent. :134 The breed is also called the Transylvanian Naked Neck, as well as the Turken. Originally from Transylvania and was largely developed in Germany. The name "Turken" arose from the mistaken idea that the bird was a hybrid of a chicken and the domestic turkey. Naked Necks are fairly common in Europe today, but are rare in North America and very common in South America. The trait for a naked neck is a dominant one controlled by one gene and is fairly easy to introduce into other breeds, however these are hybrids rather than true Naked Necks, which is a breed recognized by the American Poultry Association since 1965, it was introduced in Britain in the 1920s. 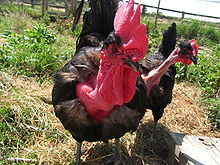 There are other breeds of naked necked chicken, such as the French naked neck, which is often confused with the Transylvanian, and the naked necked gamefowl. Despite its highly unusual appearance, the breed is not particularly known as an exhibition bird, and is a dual-purpose utility chicken. They lay a respectable number of light brown eggs, and are considered desirable for meat production because they need less plucking and they have a meaty body. They are very good foragers and are immune to most diseases. The breed is also reasonably cold hardy despite its lack of feathers. Naked Neck roosters carry a single comb, and the neck and head often become very bright red from increased sun exposure. This breed has approximately half the feathers of other chickens, making it resistant to hot weather and easier to pluck. Recognized color varieties include: black, white, cuckoo, buff, red, and blue in the United Kingdom and black, white, buff, and red in the United States. The naked-neck trait which characterizes this breed is controlled by an incompletely dominant allele (Na) located near the middle of Chromosome 3. Since this allele is dominant, individuals which are either homozygous dominant (Na/Na) or heterozygous (Na/na+) will exhibit the naked-neck characteristic though the heterozygous individual will exhibit less reduction in feathering - true breeding members of the breed must then be homozygous dominant, and all individuals in the recognized breed must be also. Individuals which are homozygous recessive (or wild type feathered) (na+/na+) would not exhibit any feather reduction characteristics of the Naked Necks and, baring mutation, would be unable to pass that trait down. Scientific studies have indicated that the naked-neck gene (Na) improves breast size and reduces heat stress in chickens of non-broiler breeds which are homozygous for the trait. Additionally, in tropical climates if the naked-neck trait (Na) is bred into broiler strains it has been shown to facilitate lower body temperature, increased body weight gain, better Feed conversion ratios and carcass traits compared to normally feathered broilers. ^ a b c Carol Ekarius (2007). Storey's Illustrated Guide to Poultry Breeds. North Adams, Massachusetts: Storey Publishing. ISBN 9781580176675. ^ Chromosome Linkages Poultry Genetics for Exhibition Breeders. Last updated: 13 Nov, 2008. ^ Chicken Mutations Poultry Genetics. Poultry Genetics for Exhibition Breeders. Last updated: 13 Nov, 2008. ^ Performance of naked neck versus normally feathered coloured broilers for growth, carcass traits and blood biochemical parameters in tropical climate PATRA B. N. ; BAIS R. K. S. ; PRASAD R. B. ; SINGH B. P. Asian-australasian journal of animal sciences: ISSN 1011-2367. 2002, vol. 15, no12, pp. 1776-1783. Graham, Chris (2006). Choosing and Keeping Chickens. 2-4 Heron Quays London E14 4JP: Octopus Publishing. ISBN 978-0-7938-0601-0. Rossier, Jay (2002). Living with Chickens. Guilford, Connecticut: The Lyons Press. ISBN 978-1-59228-013-1. This page was last edited on 30 March 2019, at 16:04 (UTC).